Today I want to consider how the notion of gradation of emphasis has a more general usefulness. Barr contrasts the open, fluid possibilities of CinemaScope with two other stylistic approaches, both found in the squarer 1.33 format. The first approach is the editing-driven one he finds in silent film. This tends to make each shot into a single “word,” and meaning arises only when shots are assembled. Barr associates this approach with Griffith and Eisenstein. The second approach, only alluded to, is that of depth staging and deep-focus shooting, typically associated with sound cinema of the late 1930s and into the 1950s. Both of these approaches, montage and single-take depth, lack the subtle simplicity of Scope’s gradation of emphasis. There are innumerable applications of this [technique] (the whole question of significant imagery is affected by it): one quite common one is the scene where two people talk, and a third watches, or just appears in the background unobtrusively—he might be a person who is relevant to the others in some way, or who is affected by what they say, and it is useful for us to be “reminded” of his presence. The simple cutaway shot coarsens the effect by being too obvious a directorial aside (Look who’s watching) and on the smaller [1.33] screen it’s difficult to play off foreground and background within the frame: the detail tends to look too obviously planted. The frame is so closed-in that any detail which is placed there must be deliberate—at some level we both feel this and know it intellectually. 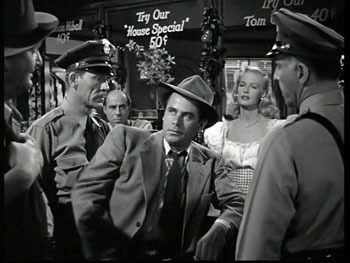 To see Barr’s point, consider a shot like this one from Framed (1947). The shot, rather typical of 1940s depth staging, displays an almost fussy precision about fitting foreground and background together. That bartender, for instance, stands squeezed into just the right spot. (2) Barr claims that we sense a certain contrivance when primary and secondary centers of interest are jammed into the 1.33 frame like this. We don’t sense the same contrivance in the widescreen format, he suggests. Not to want to split hairs here, but the notion that “we sense a certain contrivance” puts the whole reasoning on rather shaky ground. Did this feel also contrived in 1947 ? Or did it look highly realistic ? Or was it felt to be a generic noir convention, and thus not a “contrivance”, but a formalistic statement ? There are countless instances in silent Hollywood films of characters popping in and out of backgrounds (and in perfect deep focus, too), though (to speak à la Bordwell if I may) that stylistic element belongs, in the 1920s, to a different stylistic system than in the 1940s film noir. The sense of suffocation, in other words, results from a recombination of stylistic elements (close-up, large focal, many people in one frame, stark black and white organized with an abstract photographic eye) that existed before in Hollywood cinema, but were used separately or in different combinations. One is an instance of two actions taking place on different planes (Valentino flirts with Swanson as Swanson’s husband is discussing exploration plans on the sofa on foreground) and utilizes the absence of synch sound to create a working equivalent of the theatrical aside; the other of opening up story space through some sort of background device (here the desert seen through an arch). And one is not likely to forget that daunting Buddha statue standing in the background over the sacrificial ceremony in Green Goddess (1923; sorry no picture, was seen only at last Pordenone Film Festival). It doesn’t take an Eisenstein, in other words, to have film objects explode with meaning in the frame – and who’s to complain if said polysemy is beyond anyone’s control ? In fact, I can’t think of a single Hollywood film that does not have some intentional or unintentional (who cares?) gradation of emphasis. But maybe emphasis is the wrong word here, as it comes ladden with the notion of intentionality: some agent, somewhere, wants you to notice this, and therefore emphasizes it. Let’s do away with the whole (again, rather shaky) notion of intentionality here. Hollywood film images, tightly controlled though they are, brim with details that subvert one’s attention away from plot consideration (or not: the point is not to argue that we don’t watch the plot in a film, but more simply, that we don’t have to…and that the film encourages us no to, just as much as it asks us to….)(1). And one would be hard pressed to find examples of total suppression of distracting, secondary details — one in fact often finds examples of celebration of such details, especially in the 1920s. Bordwell, and Urbanora, give good examples of that for the 1900s, with dogs straying in pictures (2). This is a pretty standard idea of cinema as purveyor of many ideas to many people (you can see where this is going: to censorship). Such millenarism can only be grounded in a “perverse” (read: non normalistic) understanding of cinema: that it offers more than what plot and foreground show. Whether or not it is true, here’s a good example of that view, from Eugene V. Brewster in 1925 (3). Every day fifteen million people are learning something from the silver sheet. They unconsciously study character, manners, motives, emotions, life; their own characters are being molded by what they see and absorb. The poor learn how the rich live, the idle see the hardships of the workers, the American learns something of thhe manners and morals of his brothers across the seas, and each nation studies the other. If the motion picture were in the exclusive hands of one man, he could almost accomplish what Alexander did and Napoleon nearly did. What if Confucius, Mohammed, Zoroaster, Caesar, Luther, had had control of the motion picture ! What if Kaiser Wilhelm had had it! More powerful than the ballot or the bullet, it can sway multitudes, breed wars, make or unmake empires. Fortunately, the motion picture is free to all. (3) “Sight Gives Insight.” Motion Picture Magazine. vol. 29 No. 3, avril 1925: 5. You are currently browsing entries tagged with Beyond the Rocks (1922) at flycz.